Private house on the street. Sadovaya is located in the center of the city at the intersection of Sadovaya and Karl Marx streets, just 5 minutes walk from the beach "Massandra". The guest house is a 2-storey building, on the 1st floor there is a hall with a fireplace, a kitchen and a bathroom. 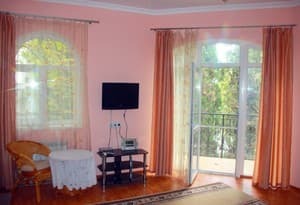 On the second floor of the guest house there is a bedroom, a living room and a bathroom. Each floor is equipped with air conditioning. On the second floor there is a balcony. 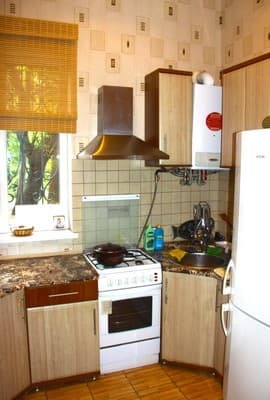 The kitchen is equipped with a full set of appliances and utensils: gas stove, refrigerator, electric kettle. In 10 minutes from the house there is the Alexander Nevsky Temple and other sights of the city. There is a parking space under the house. The distance from the bus station of Yalta is 2.6 km. Description of the room: Two-storey house, which can accommodate 4 people. On the 1st floor there is a sofa bed, on the 2nd floor there is a double bed. Extra bed (euro-clamshell) - free of charge. Private house on the street. 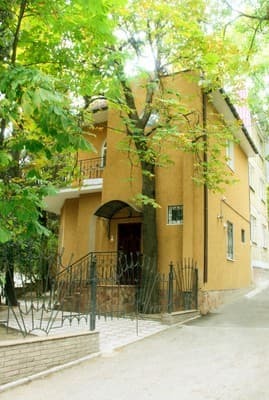 Sadovaya is located in the city center at the intersection of Sadovaya street and Karl Marx Marksa, just 5 minutes walk from the beach "Massandra". The distance from the bus station of Yalta is 2.6 km. All shuttle buses and buses going through the city center, stop "Sadovaya".